Some days you just need a little treat without the guilt, enter our Keto Lemon Poppy Seed Cupcakes (or Muffins). These low-carb muffins are fluffy and moist with a subtle citrus zing; the lemon frosting takes this humble keto snack to a whole new level. Keto Lemon Poppy Seed Muffins are not only low carb, but the high fat makes them the perfect like a fat bomb. Want more cupcakes? Head over to our Ultimate Low Carb Cupcake Recipe for the perfect chocolate and vanilla cupcake. 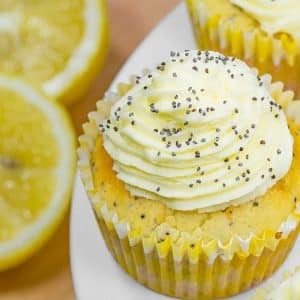 Cooking this recipe makes 12 regular sized Low Carb Keto Lemon and Poppy Seed Cupcakes. Place all cupcake ingredients into your stand mixer and mix on medium for 3 minutes, until combined. Spoon the mixture into 12 holes of a muffin tin, lined with cupcake papers. Fill each paper ¾ full. Bake for 20-25 minutes, until a skewer comes out clean when inserted in the center. Cool the cupcakes on a cake rack. While the cupcakes are cooling, place the butter and lemon juice in your stand mixer. Mix on low whilst adding the Natvia Icing Mix by the spoonful. Add the cream. Mix on medium until the ingredients are fluffy and pale. Gently spoon the mixture into a piping bag and pipe onto your cooled cupcakes. Enjoy! Some days you just need a break from chocolate, enter our Low Carb Lemon Poppy Seed Muffins. 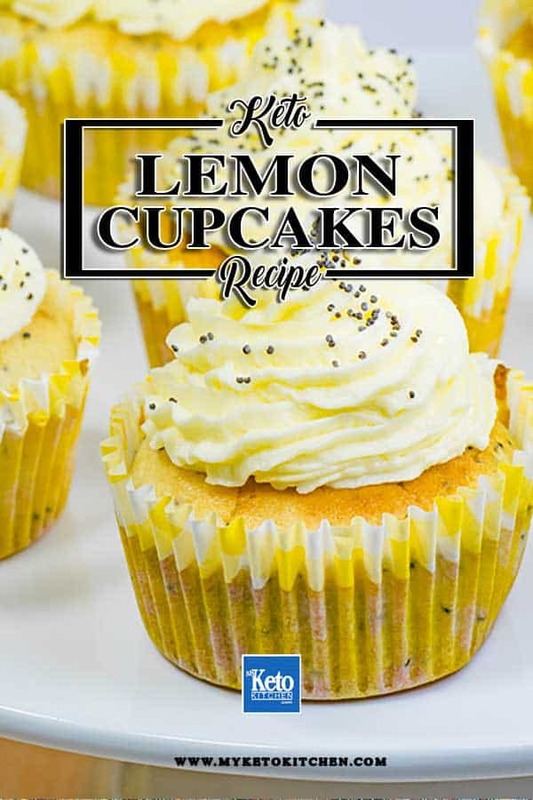 They are a fluffy and moist cake with a lovely citrus zing, and the Lemon Frosting takes our humble cupcake to a whole new refreshing level. Mix on medium until the ingredients fluffy and pale. 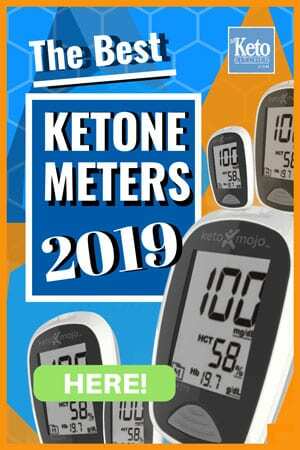 Our muffins and cupcakes recipes (and other baked goods) are made ketogenic due to our use of select low-carb keto flour substitutes. 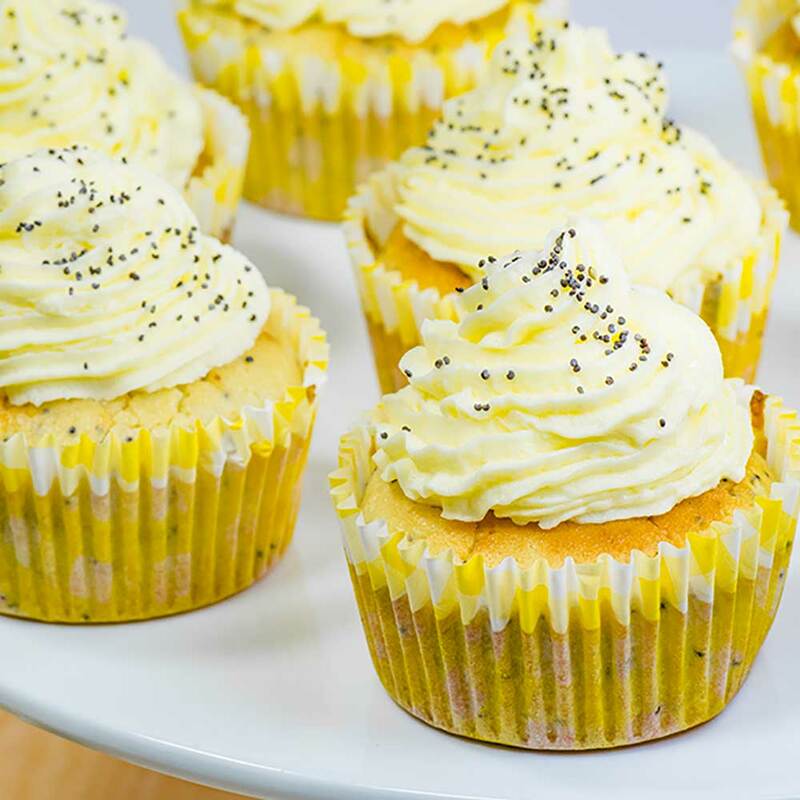 If you like these lemon and poppyseed cupcakes try our other keto baking recipes. To make a larger batch of this Low Carb Lemon Poppy Seed Keto Muffins recipe, adjust the servings in the recipe card above. I made these with granular and powdered erythritol and they were so good! Very lemony and zesty, next time I may even add more poppy seeds and lemon zest. Have you used any other sweeteners successfully? We use either xylitol, liquid stevia, erythritol or Natvia (erythritol and stevia blend) interchangeably in each recipe. Just beware that both liquid stevia and xylitol are sweeter than the others and xylitol is also toxic to pets. I hope that answers your question. If I wanted to make in a loaf pan, how long would you recommend to bake? Also if I only have powdery/granular sweetener do you think that would be ok for the frosting or do I need to seek out icing style? For a loaf pan, I would recommend dropping the temperature to 170C/340F and baking for 30 minutes to start with and monitor closely until it is cooked through. I estimate that it would take 50 minutes to cook through, but it’s better to keep an eye on it and have it turn out perfect. Let us know how it goes. The lemon zest is purely included for flavor and substituting will not affect the structure. I’d love to hear how almond ones turn out! I make these all the time now, they are amazing. Yesterday I added raspberry extract and now they are like a raspberry lemonade, so yummy. I changed the frosting to cream cheese rather than butter and I add more poopy seeds. I use swerve as my sugar. I’m going to keep changing up the flavors to see what else is tasty, I was thinking of trying a banana extract with some nuts instead next time. Very yummy! Is it really 366 calories for one little cupcake? I love them so much I want more, but hesitate with tha calorie count! We love them too Petra! Thanks for dropping by. Natvia is a sweetener that is a blend of erythritol and stevia.